Please refer to our stock # 10948 when inquiring. 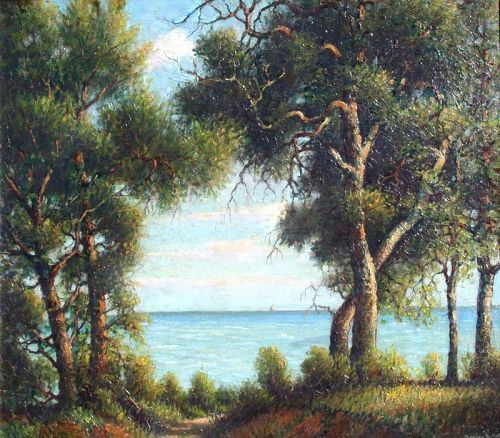 STUDIO ANTIQUES & FINE ART, INC.
"Summer on Chesapeake Bay, MD"
Benson Bond Moore, painter, etcher and teacher was born in Washington, DC. He studied at the Corcoran School of Art with Messer and Brooke , and also with Weyl . He continued his studies in drawing at the Linthicum Institute under Ballenger and learned painting conservation from his father. Active in professional societies, he was a member and officer of the Landscape Club of Washington. He was also a longtime member of the Society of Washington Artists. He exhibited with both groups from as early as 1915 and continued through the 1930's. His work was also shown at the Corcoran Gallery of Art. As an artist, he became well known and honored for his local scenes, many of which are in major public collections. His works are held by the National Museum of American Art; Historical Society of Washington, DC; Library of Congress; The White House; Bibliothèque National de Paris; Cosmos Club; National Museum of American History; the Houston Museum of Fine Art and the Los Angeles Museum of Art. Over his life, he was honored with numerous awards for his work. McMahan, Virgil. "The Artists of Washington, D.C. 1796-1996"
Consentino, Andrew and Glassie, Henry. "The Capital Image, Painters in Washington, 1800-1915"
Strass, Sephanie, "A Seasonal View - The Landscapes of Benson Bond Moore"